All major manufacturers, recommend you bring in your vacuum for service after only a year. Well, just like your dentist, routine visits help us find problems in advance that could cause bigger problems in the future and protect your investment. You and I both know that vacuums NEVER break down while they are sitting in the closet. They ONLY break down right before the relatives are supposed to arrive for your big shindig and you knock over a potted plant on the carpet spilling dirt everywhere. What a disaster! Making sure your Vacuum is running properly and use this $10 discount certificate towards the 15-step maintenance and inspection program. If you listen closely you can hear your vacuum say "Take me to Stony Brook ... PLEASE!" 2. Our 100% 6 month to 2 year guarantee on all labor, no matter what the problem. No appointment is necessary, just come in any time. We will be looking for you soon! Bring in this coupon to save $10 off your next vacuum or sewing machine full service! Offer Expires 2/15/2019. Can not combine with other offers. PS: It's like a Day Spa for your vacuum! We'll even wash and wax it! 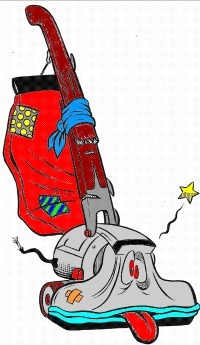 PPS: Never be without a vacuum... Free loaner vacuum available if we need to order parts for your vacuum. See store for details. PPPS: We also service and sell vacuums, sewing machines and sergers.